I’m looking back here, putting last year’s Mini Big Year in perspective as I plot out what I want to do this year. It’s already good —265 birds so far and it’s the beginning of May. I missed the Shorebird Festival this year because I’m writing another history text and my Toronto editor winced (over the phone) when I suggested I wander down to the Washington coat for a few days of wind, rain, and birds. So, I’m looking back, remembering and reviewing. Gray’s Harbor is a huge shallow bay on the coast of Washington state and it is a magnet for shorebirds and waterfowl. Aberdeen is the biggest town in the area and the hometown, I believe, of the late singer Curt Cobain. The city has seen better days but what lumber town hasn’t? Now it’s a matter of too few people in too many buildings and it’s spread out too. I always admire the spirit of those who love their town and try everything they can think of to revive the place. Sometimes it even works. 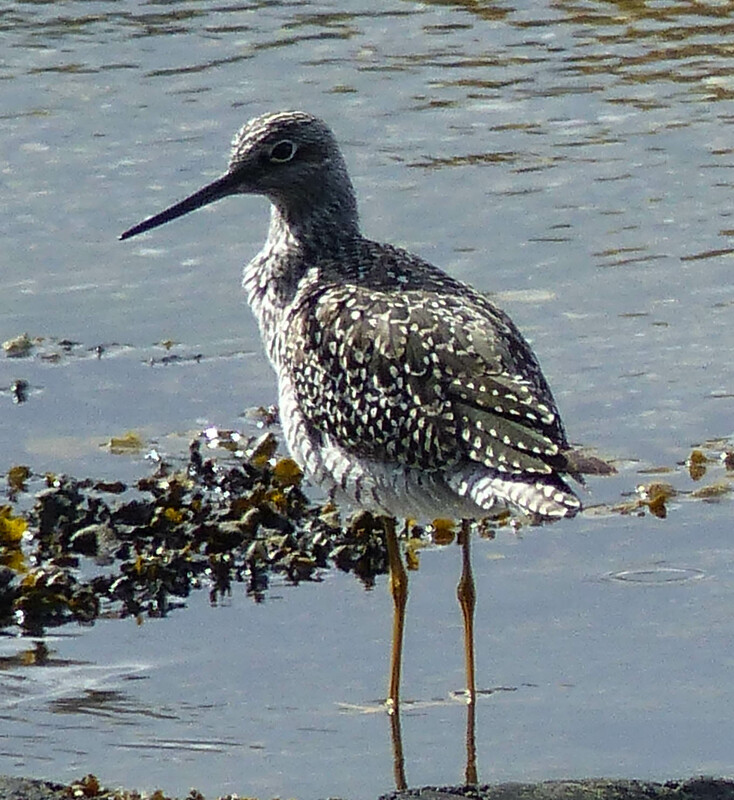 The Gray’s Harbor Shorebird Festival has its headquarters in Hoquiam — another logging town. I’m used to logging towns —I lived in one for years That was in Vanderhoof in northern British Columbia. It means I know what a cunit is. I also know what happens to these towns when the price of lumber falls, or jobs are replaced by new and better machinery. A mill bear Vanderhoof once hired 600 people but now provides work for less than a third of that. That’s what I heard. The thing is that those 150 to 200 people produce three times as much lumber as 600 did in the old days. That’s the hard reality and one reason why Aberdeen and towns like it are half empty. I decide to stay in Ocean Shores, a beach town on the open Pacific coast that never seems overly busy. Mind you, I only come here in the spring or fall so it could be hopping in mid-summer for all I know. I’ve come to like Ocean Shores and I’m not sure why. I think it’s because it reminds me of a beach town I frequented in my youth — Sauble beach, which never seems to change. There’s comfort in that. But I digress. I’m here to bird, man. I think that’s what Jack says in the movie Sideways — or something like it. I get lost a few times and but finally sort things out after two stops for coffee and donuts. I find Registration at the Wildlife Refuge office near Hoquiam, a bunker-like building half hidden by trees. I think I’ve driven by this place at least twice today. I pull in and pick up my reg. package. I also check out the birding stuff for sale. I’m a sucker for this stuff. You can’t have too many bird festival caps, right? I buy a couple of bird books I’ve wanted, Rite in the Rain notebooks, a rite in the Rain pen and, of course, caps so I can, when the time comes, write in the rain. Too bad they didn’t sell ponchos. I needed all the ‘in the rain’ gear I lay my hands on as it turned out. The rain passes and, now outside, I enjoy a brier glimpse of the sun. Someone points out the Great Horned Owl on a nesting platform in a row of trees. I have the owl on my life list but not on my year list (this is early last year, remember). Except that I haven’t yet thought about keeping a year list. That thought gels over the next few days. I drive to the local airport because that’s where the entrance to the Gray Harbor National wildlife Refuge is hidden away. A heavy rain thunders down and then stops. I’m not really equipped for heavy rain but another patch of blue in the sky gives me hope. If there’s enough blue in the sky to make a man a pair of pants, it will clear, my mother told me. You can see the problem here. To start with, how big is the man? Are we talking overalls or shorts? Anyway, the hope was false as it turned out. The rest of the afternoon is blustery, to put it mildly. The driving rain and the gale force winds confirm that I’m definitely at the Shorebird Festival in Gray’s Harbour. I nearly kill myself a few times on a treacherously slick walkway before I arrive at the viewing area. This is half way around a boardwalk loop where a dozen or so birders, coated and hatted against the elements, hunch over their spotting scopes. They’re a friendly bunch and several offer me views through their glass. There isn’t much to see, the tide is just starting to ebb and the mudflats where the birds feed are underwater. Some greater white-fronted geese float in gray rafts along a distant shore. After a half hour or so, I’m very wet and growing impatient. This is not a good quality in a birder. But then I see the tide is in fact ebbing and sections of mud slowly appear like a magical reveal. Almost at once, large flocks of birds swing into view, searching for places to land. A cloud made up of several thousand Western Sandpipers hums by our station, flying low and fast, swirling like autumn leaves caught up in a north wind. Two Yellowlegs pass over, tip down, circle and then carry on looking for somewhere better. Several hundred dumpy Dowitchers cruise past, their white rumps flashing in the gloom. More mudflats appear as the water level drops. Peeps begin to alight en masse and immediately begin to feed. I find half a granola bar in a pocket and scarf it down. It’s exciting, all these birds. A thousand Dunlins materialize to my right. The birds move constantly. Suddenly all take wing. We look skyward. A Peregrine is hunting the marsh, even without the fabled and lethal stoop its speed is blinding. The peeps rise up in bewildering clouds, a seemingly choreographed display of white, brown and gray, designed to confuse the raptor. It’s their only chance. The attacking bird plummets through the knotty center of a sub-flock and then it lumbers up into the sky, talons empty – a miss this time. The ‘confuse winged death’ tactic worked. I’m now soaked to the skin and hungry too. Time to go back to the motel in Ocean Shores to change clothes. I slip and slide back my way down the boardwalk and walk out past the hangers of the airport to my car. Two hours later, I’m in Ocean Shores, in dry clothes. The beach is on the other side of a line of dunes and small marshes. I’ll go there later. I need food.